Recieved USAF Pilots Wings in 1951 and flew 100 combat missions in Korea. 1952, jet flight instructor, Bryan, Texas. 1955, attended USAF Institute of Technology at Wright-Patterson AFB in Ohio, studying Aeronautical Engineering. 1956 graduated from USAF Test Pilot School at Edwards AFB, California. 1957, assigned as test pilot, fighter branch, Wright-Patterson AFB where he worked until selected by NASA. July 21, 1961, became the second American in space aboard the Mercury spacecraft Liberty Bell 7. March 23, 1965, Command Pilot on the first two man flight by NASA. 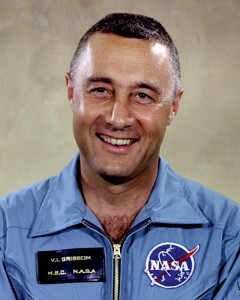 Gemini 3 orbited the earth three times and Grissom performed the first orbital trajectory changes of a manned spacecraft in history. 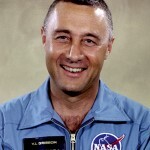 Gus Grissom died January 27, 1967, along with his crew of Edward H. White II and Roger B. Chaffee in the Apollo 1 fire at the Kennedy Space Center in Florida. for the first manned Apollo mission.